In tribute to the late Cy Twombly, Gagosian Gallery presents CY TWOMBLY: The Last Paintings – an exhibition that shows his last paintings and one hundred of his photographs, ranging from early studio impressions from the 1950s to a group of landscape subjects that he took in St Barths last year. 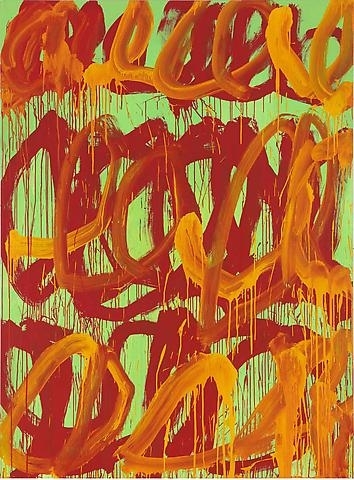 The inimitable, exuberant paintwork and bold, intense colors typify the freedom with which Twombly worked, never restricted to a single reference. Even in the face of his impending death, their elegiac power, vivid palette, and ardent gestures pulse with the energies of the new. Twombly remains one of the world’s most revered contemporary artists, whose central and ongoing relevance to the art of the present is attested to by a stream of recent survey exhibitions in leading international institutions. Cy Twombly (1928–2011) was born in 1928 in Lexington, Virginia. He studied at the School of the Museum of Fine Arts, Boston (1947–49); the Art Students League, New York (1950–51); and Black Mountain College, North Carolina (1951–52). In the mid-1950s, following travels in Europe and Africa, he emerged as a prominent figure among a group of artists working in New York that included Robert Rauschenberg and Jasper Johns.